We do not know what the new devices will look like. The image used in the article is just for demonstration of the unit's size. But it doesn't matter, I suppose they'd be filling another niche in the market. Not for me though. Anything over 5" is getting too big. My S3's 4.8" screen is big enough for me. The supposed screen size of the Mega 5.8 is bigger than all of my Xperia P (which is the largest phone I own at the moment). 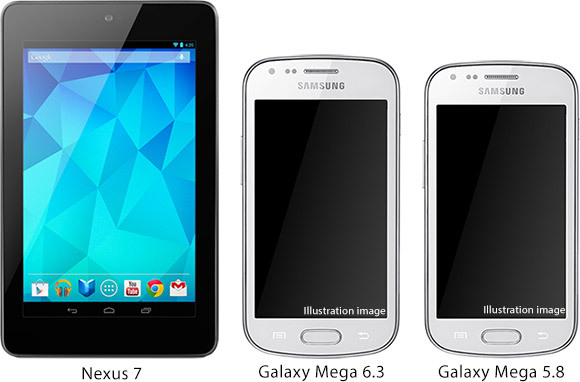 Well they cant get too big otherwise they become a tablet, like the 7" Note. I personally don't think theres market for 6" phones. Where is the line between a 7" tablet and a mobile phone ? I was considering buying a Nexus 7 the other day for my girlfriend, but to be honest its screen is too small for a tablet. Kind of defeats the purpose of a tablet.